LAS VEGAS–(BUSINESS WIRE)–UBTECH Robotics, the company that created the cutting-edge Alpha Series of humanoid robots, today introduced LionBot, the latest addition to its line of STEM-friendly Jimu Robots for kids and teens. The Jimu Robot LionBot was designed exclusively with Apple to emulate the lion costumes seen in the Chinese New Year parades, whose dance represents warding off bad luck, scaring away evil spirits, as well as ushering in good luck and thanks-giving. UBTECH will be showcasing LionBot as part of CES in Sands Expo, Hall A-D, booth #42151, January 5–8, 2017 in Las Vegas, Nevada. LionBot has an infrared sensor that can track and move along lines, as well as detect objects to maneuver around. 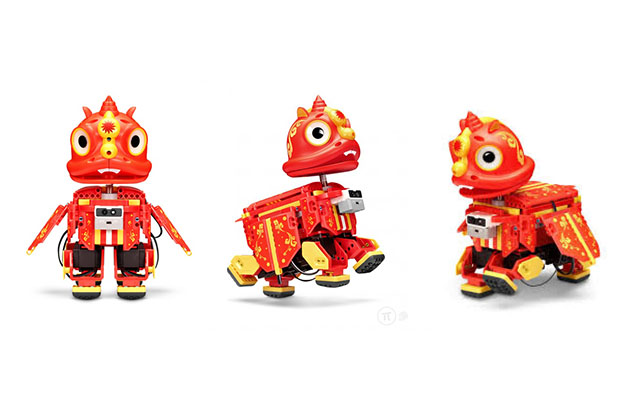 LionBot is also the first Jimu Robot to feature a bobbling character head, bringing a whole new level of personality to robot construction, and offering the ideal way to celebrate the Chinese New Year. LionBot is an interactive building block kit that combines learning and fun as kids build, program and share their robot creations. The Jimu Robot LionBot Kit retails for $129.95 and is exclusively available at Apple.com and in select Apple Stores. The Jimu Robot LionBot Kit has all the parts, connectors and servo motors needed to build LionBot or your own invention. The kit includes the Jimu Robot app with step-by-step 3D instructions including zoom and 360 degree views to make building the robot easy. Once built, the app features pre-programmed actions with Blockly coding or the ability to program your own actions to make LionBot do almost anything. An in-app joystick remote also lets you control your LionBot on your iPhone, iPad and iPod touch. Additionally, the app connects users to the global Jimu community to share their creation or programming with Jimu Robot lovers around the world. The JIMU Robot app for iPhone, iPad and iPod touch is available free, exclusively on the App Store. Jimu Robots were designed to enrich children’s lives and are appropriate for children over 8, and are especially strong for boys and girls 9-14. Jimu Robots were built from the ground up to specifically meet the needs of STEM (Science Technology, Engineering, Math) curriculum.